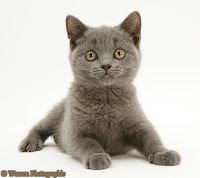 British Shorthair is a breed of short haired cats native to United Kingdom. They originated centuries ago when Romans brought cats from their homeland and those cats mated with wild cats of Britain. With time the British Shorthairs came to being. However, it was not until the later half of nineteenth century that these felines started appearing in cat shows and began to be formally recognized. Originally they were accepted only in blue color and were thus known as British Blue. With time though other colors were given formal recognition and the name changed to the current one. British Shorthairs are somewhat large sized with a muscular physique. They have strong chest, shoulders and legs and are known to possess significant strength relative to their size. Body is stout overall. Head is round with chubby cheeks, big round eyes that are usually copper to golden in color, and short widely set ears. Well developed whisker pads give rise to a very sweet 'smiling' facial expression. Tail is tapering at its end and paws are rounded. Apart from blue, which is the most common color, other colors and patterns include black, chocolate, cinnamon, fawn, lilac, red, white, bicolor, colorpoint, tabby and tortoiseshell. 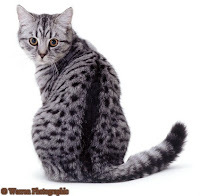 British Shorthairs are healthy and sturdy felines. They don't suffer from any persisting health ailment in their lines. They are relatively heavy as a breed and not very agile. They are active though and have been reported throughout history to be quite capable hunters in their natural environment. Easy going and calm, British Shorthair cats have a very good temperament. They are independent and playful and not very demanding. Their lustrous coat doesn't shed nor require daily grooming. As kittens they are quite playful. As they age, taking nearly four years to reach their full size, they become relatively sedentary and overweight in some cases. Still they maintain their loyalty and affection towards humans. 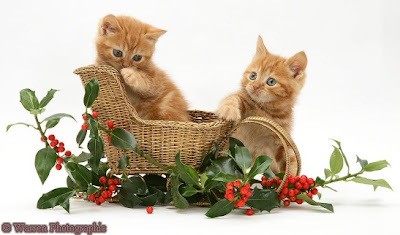 Owing to their pleasant nature and beauty, the charming British Shorthairs are Britain's most popular feline breed according to official figures. My favourite breed :) I have one, Archie, and he's just gorgeous.